NASA's Chandra X-ray Observatory captured four rings of X-ray emissions, pointing to the precise location of a powerful neutron star at their center. 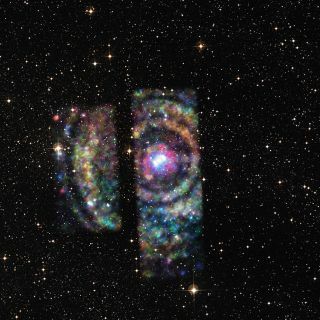 The X-ray observations are overlaid on an optical view of the star, Circinus X-1, and its neighborhood. Four vivid concentric rings caused by a furious X-ray flare-up mark the spot of a superdense stellar corpse, a new study reports. This newly observed "X-ray echo" — the largest and brightest of its type ever caught on camera — has allowed researchers to pin down the location of the neutron star Circinus X-1, which was found to lie 30,700 light-years from Earth. Circinus X-1 is a tiny remnant left over after a massive star died in a violent supernova explosion. The neutron star orbits in a binary system with another massive star and tends to emit intense X-rays into the surrounding dust-filled space. NASA's Earth-orbiting Chandra X-ray Observatory recorded a particularly intense X-ray emission in 2013. The X-rays from the big flare came to Earth over the span of a few months and at slightly different angles as they bounced off dust clouds, so researchers could gauge how their source, the neutron star, was positioned relative to the rings. Then, by cross-referencing the information with data from the Mopra radio telescope in Australia, which had already found the distance to those dust clouds, the researchers were able to determine exactly where in space the neutron star sat. An artist's illustration shows the X-rays from neutron star Circinus X-1 bouncing off four dust clouds on their way out. The dust clouds closer to Earth created larger-looking rings, and the actual sizes of the rings range from 41 to 52 light-years across. The neutron star is highly variable, going through periods of quiet and intense flares, but in its brightest moments it emits levels of radiation more often seen emanating from black holes than mere neutron stars, researchers said. Circinus X-1 is also the youngest X-ray binary known; scientists think it started emitting strong X-rays just 2,500 years ago as seen on Earth. "Circinus X-1 acts in some ways like a neutron star and in some like a black hole," co-author Catherine Braiding, of the University of New South Wales in Sydney, Australia, said in the same statement. "It's extremely unusual to find an object that has such a blend of these properties." Combining the X-ray echoes from the neutron star with the earlier radio mapping of the dust cloud offers an unusually precise description of the location and 3-D structure of the galaxy in which it resides. "We like to call this system 'Lord of the Rings,' but this one has nothing to do with Sauron," co-author Michael Burton, also of the University of New South Wales, said in the statement. "The beautiful match between the Chandra X-ray rings and the Mopra radio images of the different clouds is really a first in astronomy." The research was published this month in The Astrophysical Journal.